This week the challenge is to use a spiral as a string. 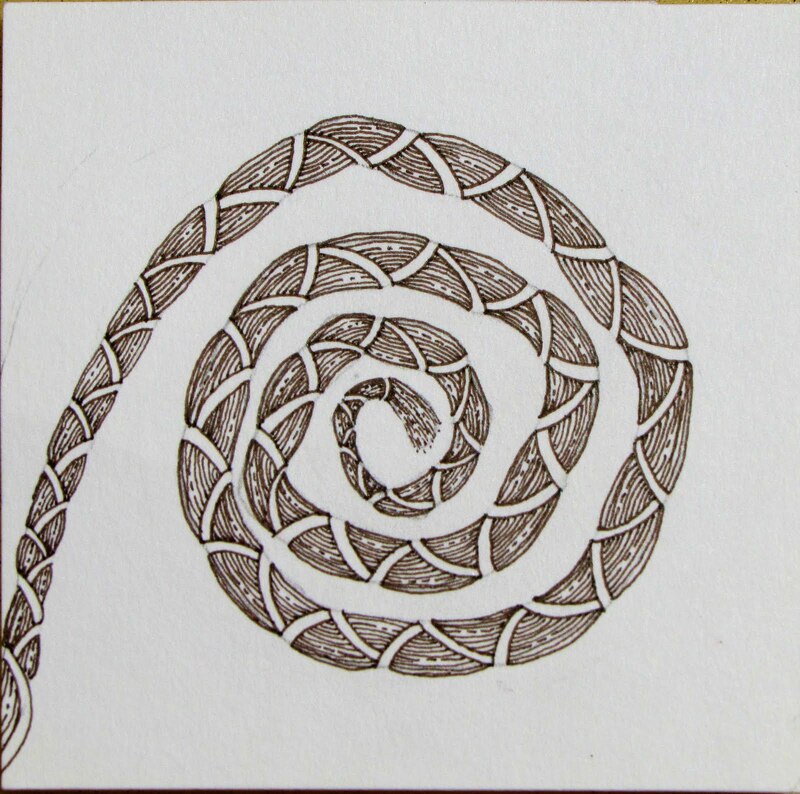 Another great challenge for me as I really haven't used a spiral before. 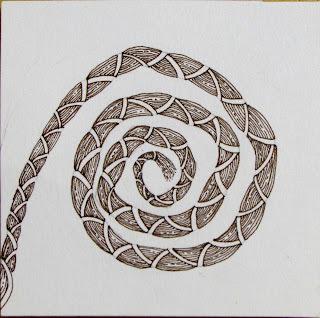 I hardly use spiral style tangles and I certainly haven't used a spiral as a string. Yea for another challenge that makes me do something I haven't done before! 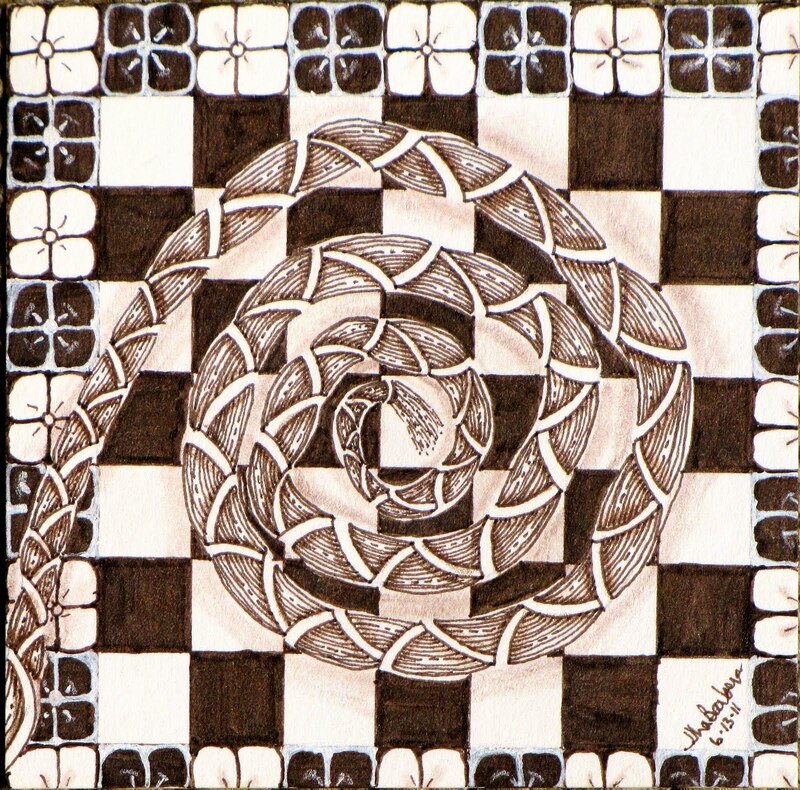 Yesterday, Sandra Strait sent out a tweet with a link to Brayd, a new tangle from Shelly Bauch. I really like it. It is fun and looks more complex than it is. Once I saw that the challenge was a spiral, I knew that I was going to give Brayd a try. I used the sepia micron for this challenge. I wanted to experiment with trying to shade the sepia and a challenge is a great place to stretch myself. 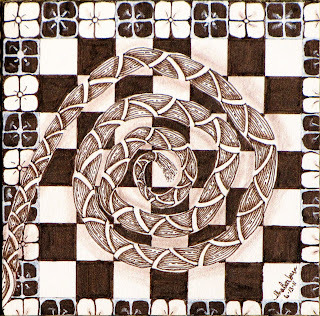 I used Derwent drawing pencils and Lyra Rembrant Polycolor colored pencil in Van Dyke brown for shading. To shade with the Derwent pencils, I rubbed the color on a tortillion and then used the colored tortillion to shade. In shading that way, I'm able to get the color smudged on the way I want. I can also go back and layer on more color if I want it darker. For the white, I used a gellyroll pen. So, without further explanation, here is my tile. I was planning on combining buttercup with the knightsbridge for the entire background but once I started, I decided that I didn't like it as much as I thought I would. I think that it's the gellyroll pen. I kept pressing down too hard I think. I need to get a better white pen. The gellyroll is great for many things, but I dislike the way the ink flows. I like how the Brayd came out. I will certainly be using it again. I think that it will be a new favorite. Brayd before I added background and shading. Before shading and buttercup. I think I should have stopped here. I totally forgot to post a link to the challenge this week. See the challenge button over on the side. It will take you there. Lovely! Nice to see you process! Your Brayd is beautiful, thanks for sharing your process. Oh wonderfully brayded! I am glad you found it easier than you thought it would be! I love your brayd. I haven't used that pattern yet and I must change that soon. I like the finished tile the best! I'm glad you didn't stop! !